Steven Wilson felt suicidal last fall and had gone to Legacy Good Samaritan Medical Center for help, but was released hours later. He returned to his Portland apartment, later grabbed his psychiatric medication and went to a nearby MAX stop. Then he threw the pills on the ground. 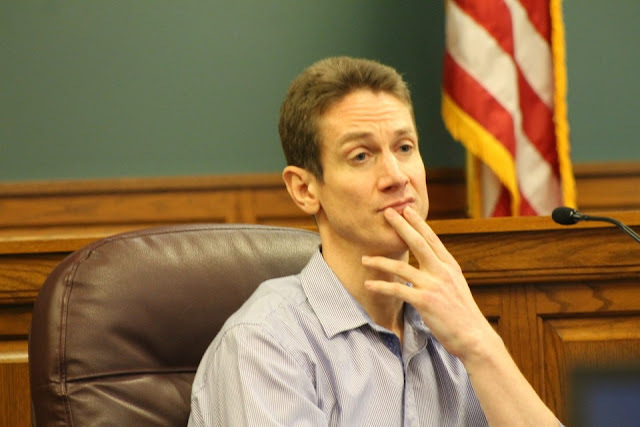 A voice inside his head told him: If you're serious about killing yourself, you don't need your medicine, Wilson told the jury Friday during his attempted murder trial. The voice also said he needed to die to keep his mother alive. From there, Wilson testified, he remembers only snippets. He's accused of shooting a Clackamas County deputy with the deputy's own gun in a Nov. 15, 2016 encounter that left them both injured. Wilson, 40, said he somehow got to a home in Clackamas where his mother no longer lived and took a blanket off a neighbor's porch. He doesn't remember later walking into traffic along Southeast Sunnyside Road during the early morning traffic commute, he said. Nor being hit by at least one car or the two women who stopped to try to help him afterward. He said he doesn't remember the deputy who responded to the scene, but said he did recall at some point seeing a gun in front of him and a voice in his head repeatedly telling him, "Grab the gun and kill yourself."